This is the tale of a cherished diamond engagement ring. The story began back in the middle 1960s. John and Carol met, courted and fell in love. When Carol finally stopped saying "No, I don't want to get married" and said "Okay, I'm sure now. I know you are the one (and only one) for me! ", it became time to choose an engagement ring. Carol's Boss had a connection in the wholesale jewelry business and, since John and Carol were just starting out, not rich and wanted to make their money go as far as possible, they decided to buy their rings through "George". Carol and John went to a trade show and looked at lots of wedding sets and wedding bands. Carol's very favorite was a solitaire setting in which the diamond just seemed to float above the band in a tiffany mounting. The plain gold wedding band nestled perfectly into the v formed at the base of the diamond and Carol's heart went pity-pat at the very thought of being presented with this ring. John told George how much he could spend, George ordered the rings and in due course, the happy, excited couple went to pick them up from the jeweler. Carol and John have two dearly loved daughters, have bought a house, have owned two different cars and a pickup truck, have gone on some wonderful camping trips during summer vacations and are very busy with family life and are, for the most part, even more happy, content and in love than when they were first married. One cold, snowy day, John headed off to work, well before the sun came up. After it got fully light,Carol went out and swept snow from the driveway and then spent nearly the whole morning running errands including a trip to the grocery store. She puttered around the house until the girls got home from school. As Carol pulled on a sweater, the prong from her engagement ring snagged the yarn. She looked down to untangle it and to her absolute horror, discovers that the diamond is gone from the mounting! Well, she just can't believe it but she also cannot help but start weeping hysterically. The girls come running to see why Mom is 'taking on so' and are bewildered and trying to console their very sad Mommy. Both say "Maybe we can find it, Mommy". But Carol is convinced that the diamond could be anywhere from being trampled into the frozen mud out by the driveway, to being swept from the floor of the grocery store to "who knows where---and it's just gone for good"---and fresh gales of weeping overtake her. Debbie begins to look all around the house, while Mom continues to boo hoo, helplessly. Suddenly, Debbie calls out, excitedly, "I found it! I found it!" Of course it cannot possibly be..... but, incredibly, it is! With all the "running around" while doing errands, the diamond had been dislodged from it's setting at sometime while in our own kitchen. Our sharp-eyed daughter, Debbie, had spotted it on the floor. And brought sunshine back into the little Abbott house on that blustery winter day. 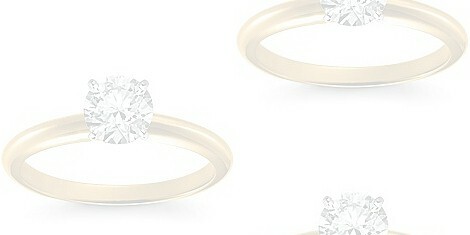 As soon as possible, a jeweler resets the stone, lowering the prongs on the tiffany setting to a more practical level. The diamond no longer "floats" but is infinitely more secure. I look at it frequently, with a critical eye to be sure it remains snug and thank my "lucky stars" that I was so fortunate to still have it. This May, we managed to plan a wonderful five day getaway to the beautiful Ozark Hills of Eureka Springs, Arkansas. Our goal was to make this a totally laid back and worry-free vacation. Just slow, lazy days of good food, lots of walks around town, browsing in the many shops and snuggling in front of the fireplace with a good book and each other. We decided to ride down from Kansas City on the motorcycle, which meant figuring how to use every available inch in the saddle bags to pack the necessities for both of us. I announced early on that I needed enough space to stow a regular purse, since I don't much care for fanny packs. The designated spot is in the leather side bag which stays on the bike all the time. The first full day in town, we head downtown to browse the shops and get some late lunch. At lunch I sit and fiddle to line up my rings so that the "v" is positioned correctly. Since I have lost weight, my rings turn much more freely on my finger. I am admiring the pretty anniversary band which I sandwiched between the wedding band and the diamond solitaire when John presented it to me at Christmas time this past year. After lunch we headed back to the Victorian era inn, where we are staying, but on the way, we ride out to the highway to get a bottle of shampoo. (A rule of traveling seems to be that you always forget at least one thing when packing) After that stop, we spot a store selling Christmas ornaments and decide to stop to look for a memento of our trip. Then we see an ice cream shop and go in to get a cone. Then it's back on the bike, one more time, to head back to dress for the Passion Play performance that evening. As we pull forward to leave the parking lot, my hand scrapes the top of the saddlebag where I have stowed my purse. I glance down and it is twenty years ago all over again! There glaring up at me is the empty gold mounting of my engagement ring! John hears my moan and stops the bike in the parking lot. "What's the matter?" It is the hardest thing in the world to have to tell him: "My diamond is gone." He suggests that it might have gotten caught in my glove but I know that I haven't had them on any time during the afternoon, since it was quite warm. He asks me where I want to look but I have to say that trying to find such a little thing would be impossible. We had stopped nearly half a dozen times since lunch, when I know that it was still there. With tears in my eyes I tell John, "Let's just go on. It is hopeless." He tells me "It will be okay. We can replace the diamond." He knows how upset I am but just doesn't know how to fix it. We must pass through the woods on the way back and traveling slowly, John spots a deer through the trees and points it out to me. My eyes are teary, but I am glad to see this beautiful creature. We have always enjoyed seeing wild life on all our trips. We are approaching a parking turnout with a scenic overlook of the town and John asks if I'd like to stop. "Yes, that would be fine" is the best I can do in response. I feel drained with disappointment but life goes on. I try to remind myself of that fact. We stop and get off the bike. "I just feel so sad" I tell him when he hugs me, as we stand there taking a bird's eye view of lovely Eureka Springs. "I know" he says. Then he kneels over the saddlebag where my purse is stored. He lifts out the purse and hands it to me. "You are a very lucky woman," he says and for just a tick I think "how can he say such a thing when I have just lost something so precious to me?" Then I realize what he means as he carefully reaches in and pulls out the diamond from the saddle bag. I cried even harder with relief and wonder than I had before. What an incredible thing to happen! Once was to stretch credibility. Twice is nearly impossible to believe. There will be no "Third Time is the Charm". I will be consulting a jeweler about changing the style of the ring to ensure that the stone is not exposed again. My precious engagement diamond seems to be as enduring as has been our marriage. My Lucky Diamond is a daily reminder of all the good luck that has been in my life by sharing it with my wonderful husband, John. I thank God for him every day. And you can bet I said a little prayer of Thanksgiving for still having my diamond, when I went to church this weekend.